Teaspoon of Ginger | Adventures, photos, insights & stories of a ginger and her clan. I’ve changed a lot in the last year. Not fast enough for some and maybe too fast for others, but I’m changing regardless. How can I not? What a year it’s been. It’s not been fun, I won’t lie. It hasn’t all been bad either. I’ve fought tooth and nail to get myself to where I’m currently at, despite the fact that I seem to still resemble a total mess of a person. The thing is, I’ve been called a lot of things this past year, hurtful things that have done damage and some that have made me pause and think. The pause and think things have caused a shift. My kids are changing as well. It’s been a tough year for them too. My oldest is more drawn to me. I’m not used to it. That’s not saying I don’t like it, but she’s never been the cuddling type, not with me. I know I am not the easiest to cuddle either, we are both a bit restless, can’t just relax. So it’s nice, but I have to adjust and of course I am. If I didn’t that would officially take away my decent person/mother card. And I take what I can get these days. I’m becoming a little softer. Easier to approach. I’m trying to be easier on them and I know that is helping. We are all responding to the shifts in the positive. Even with my ex, things are easier and it’s proving to be beneficial for all. I don’t truly recognize my reflection in the mirror anymore, or maybe I never really did and I’m finally coming into my own. Who knows. All I do know is that my 40th year has been one hell of a journey so far. I’ve been told I don’t know how to accept love. I now believe that to be true. How depressing. How can someone not accept love? Not accept nurturing? Not see the negative and instead see the positive? How damaged does one have to be to have this be the case and more importantly, can it be repaired? I hope so. It’s not that I don’t want to accept it, I just think I am terrified to let someone else in. My heart is pretty beat up. When I think I have my walls down, one more tries to pop up and I am not even aware until it’s too late. My head is trying to protect me for some reason. Maybe it’s jealous. Yes, that has to be it. It sees that I have supportive and loving friends, and its own insecurities can’t take it, so instead it builds up a new wall, has me overreact and we all know how overreaction usually ends. Not well. I want and intend to accept this gift of love and support with grace because it’s not given lightly, but it does terrify me. But a little fear and acceptance is good for the soul. Or so I’ve heard. I guess I just have to accept it. I saw this today on my Facebook feed and its timing is impeccable. Just yesterday, and many before, I have been accused of not opening up fully. 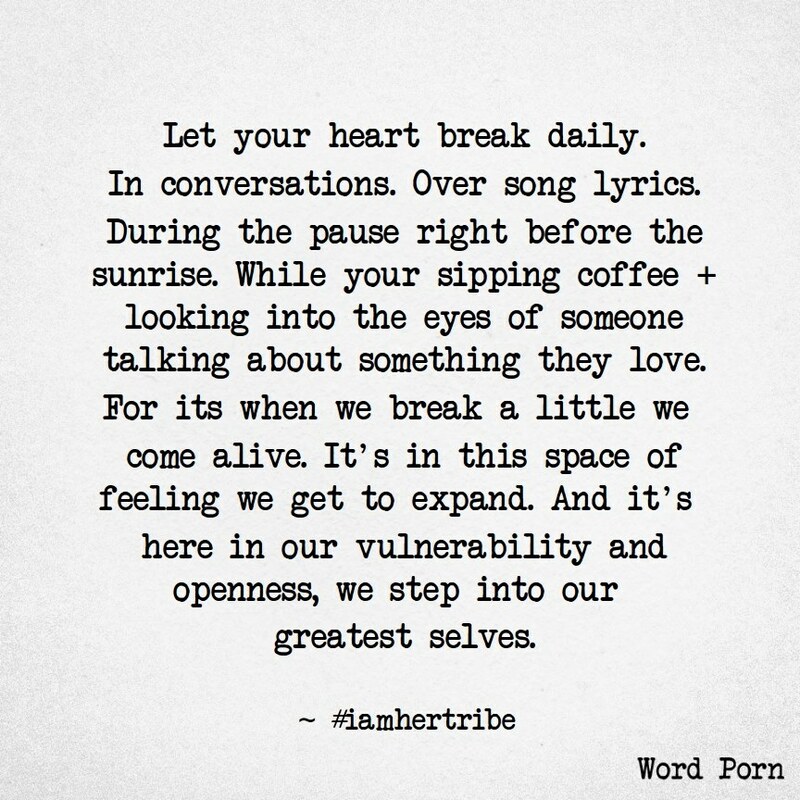 Not really truly opening up and letting myself be vulnerable, weak, alive. Taking that risk of getting hurt and ultimately trusting the person on the receiving end. And sure, when one puts it like that, who the hell would want to do that? As I go through this journey of figuring out who I am, I think I’ve hit a standstill. I do fight truly opening up, but at the same time, I honestly feel like I am open. Maybe I just don’t really know how to do it? Could be that, but I think my fear is trust. I have been hurt a lot by those that should not have. Not saying anyone should hurt you, but those that were supposed to be your guides, rocks, partners & family. When those foundations break your trust and your heart, it takes a lot to come back from that. What I didn’t know was just how much I had been damaged. I’m finding this out along my journey and it’s hard. It’s hard, ugly and depressing, which is to be expected. But there are some bright points. I’m avoiding one specific issue I truly need to confront but the reality of the resolution, either way, is so beyond my frame of mind right now, I just can’t. I cannot wrap my brain around it. I filled my time with projects and obligations to avoid certain things and people and to fill something that was missing in my life, which was one thing I realized when I took the time to think about it once things had broken down. I didn’t realize that’s what I was doing to fill this hole. Once that became known, a weight was lifted. I’m now working on ridding myself of some of those burdens as I’m stretched far too thin. But again, it was avoidance. Something I’ve been told I’m a master at, along with deflection. I don’t like conflict. I don’t go seeking it, but it seems to find me. I don’t know why. Maybe my personality just creates it. Maybe I create drama, which I also hate. I don’t do it on purpose, or better yet, consciously. Do I like being faced with my issues, no. Who does? Who wants to learn they are damaged, maybe so much so, that they don’t know when they are hurting others with their words or lack of words? My god, that’s the last thing I want to do to someone, but it happens. Opening up is really, really hard for me. Truly trusting is a challenge and very few, I can honestly count on one hand, the number of people who have my trust. And maybe only one of those, will I truly open up to and even then it’s a struggle and I think I fail them everyday. I have these walls that I can’t seem to break through and I hate them. I feel a severe desire to keep myself safe, that only I can do it. I need to realize that people care and not all are out to eventually hurt me. I need to get these walls down. Or they will destroy what good I have in my life. An assault on women’s rights, defend. An assault on LGBT rights, defend. An assault on an entire race of people, defend. An assault in general to our basic human rights and integrity, defend. If defending the rights of others to live a safe, prosperous life with the same exact rights as you and freedom to worship, or not worship, as they like, isn’t automatic to you, then you might need to rethink your priorities because we are all in this together, whether you like it or not. The last week and a half have done nothing but boost my desire to defend those that need it. To defend this country, it’s values and it’s foundation. It’s honestly, to me at least, a pretty automatic reaction, no questions asked.